Connecticut lost 3,600 jobs from September to October, driven partly by a large drop in education and health services positions. New England is sliding into a "significant recession" and is expected to lose a quarter-million jobs during the rest of the decade. Economists at the New England Economic Partnership forecast Thursday that unemployment in the region would rise to its highest level since 1992, hitting more than 8 percent by mid-2010. The 250,000 job loss throughout New England is about 3.6 percent of the region's employment, which will decline for the rest of the decade and then flatten out through 2011. 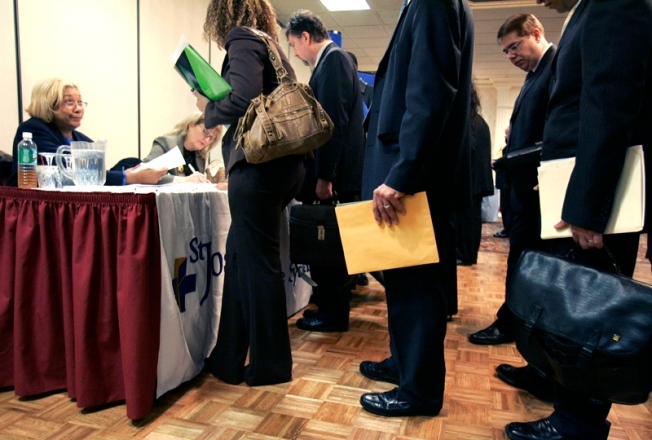 Employment in Connecticut was just under 1.7 million and the unemployment rate of 6.5 percent was up from September's rate of 6.1 percent. Connecticut's rate now matches the national unemployment figure. State labor economist John Tirinzonie says Connecticut lost 5,900 jobs in the last two months. That puts its total employment below the October 2007 figure, and at its lowest level for 2008. He says Connecticut probably will keep losing jobs into at least the first half of 2009. The Waterbury area had the state's highest unemployment rate at 7.9 percent, followed by the Willimantic-Danielson area at 7.0 percent. The lowest was 4.8 percent in greater Danbury. NEEP releases its economic forecasts twice a year. Rhode Island is expected to top the list, peaking at 10.3 percent unemployment, while Vermont and New Hampshire unemployment rates would increase the least.